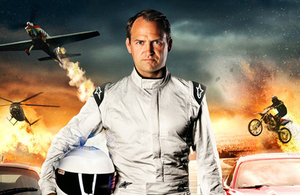 'Stay safe, stay back' is the message from professional racing driver and Hollywood stunt expert Ben Collins to help remind drivers of the dangers of tailgating. I discovered the dangers of tailgating at a very early age - in an overly enthusiastic game of musical chairs. The music stopped. So did the kid in front of me. But I didn’t. I face-planted the back of his head instead. A survey by the company revealed that tailgating is the biggest single bugbear that drivers have about other road users. And in-car research - using dashcams, facial recognition, emotion tracking and heart monitors - reveals that a driver’s typical reaction to someone who tailgates them is surprise, anger and contempt, with a spike in heart rate. It is intimidating and frightening if you’re on the receiving end. If that leads to a collision, then people in both vehicles could end up seriously injured or killed. We want everyone to travel safely, so the advice is - stay safe, stay back.